Researchers have uncovered how proteins found in our blood can reduce damage caused to blood vessels as we age, and in conditions such as atherosclerosis and arthritis. Calcification is a major risk factor for heart attack and stroke. Blood vessels can harden as calcium phosphate (CaP) crystals, normally found in bones and teeth, build up in soft tissue as we age or as a result of illness. This can lead to complications in patients with atherosclerosis, a major cause of death in the UK whereby arteries thicken and are at risk of becoming blocked. However a team of scientists at the BBSRC-funded Babraham Institute has discovered how CaP damages vessels, and how proteins normally found in our circulation can help prevent this process. In the study funded by the British Heart Foundation, researchers found that small CaP crystals were being consumed by blood vessel cells, resulting in abnormally high levels of calcium ions, which can prove toxic. They discovered that two proteins in the blood, fetuin-A and albumin, can slow down the uptake of CaP crystals by blood vessel cells, reducing the release of calcium ions and protecting against damage. 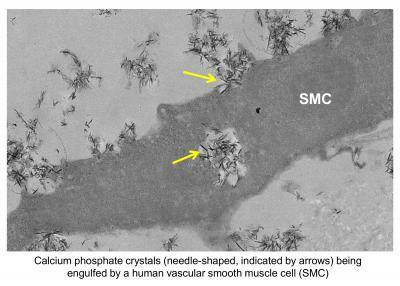 Calcium phosphate crystals (needle-shaped, indicated by arrows) are being engulfed by a human vascular smooth muscle cell (SMC). Dr Diane Proudfoot, who led the study, explained: "Small changes in calcium levels within a cell controls many aspects of normal cell function. However, when calcium levels become excessive, the cell can die. By delaying the uptake of these crystals and reducing the release of calcium ions, proteins fetuin-A and albumin can help to keep calcium ions at a safe level." The research, published today in the journal PLOS ONE, offers potential to develop treatments to prevent and reduce the damaging effects of CaP crystals. Dr Proudfoot added: "Interestingly, lower levels of these proteins have been observed in patients with chronic kidney disease who can suffer a higher level of mortality due to cardiovascular disease. In the future, there is potential to use fetuin-A that has been artificially created or extracted from blood as a treatment for patients with low levels of this protein." Professor Melanie Welham, BBSRC Executive Director for Science, said: "BBSRC-funded science helps us to explore the biological processes that underpin our health. This research provides important insights into healthy ageing and may lead to therapeutic strategies to prevent the problems associated with calcification in ageing and several diseases."